It’s 94 degrees outside right now and I just can’t be bothered to eat something hot, can you? It always happens at this time of year, when I gravitate towards ‘cool’ foods – like bruschetta, guacamole…or my all time favorite pasta salad. 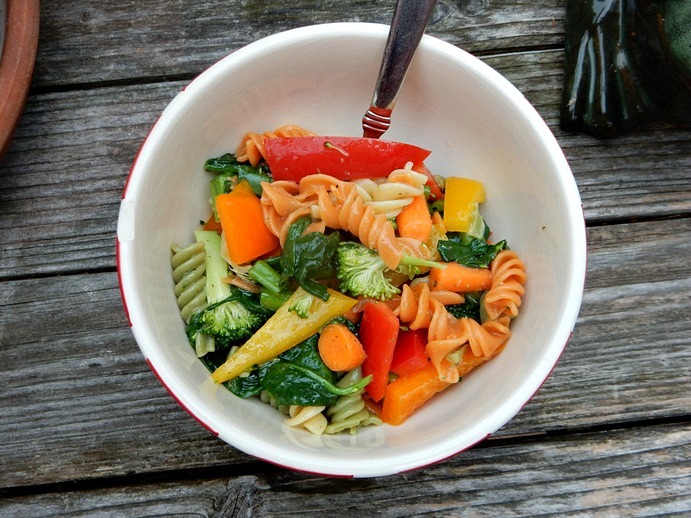 Truly, is there anything better on a hot summer day than a refreshing bowl of pasta salad? Dare I say, not. Be it at a cookout, family barbecue, packed as a lunch or as dinner on the sofa whilst watching Netflix…pasta salad is quintessentially…the bomb. 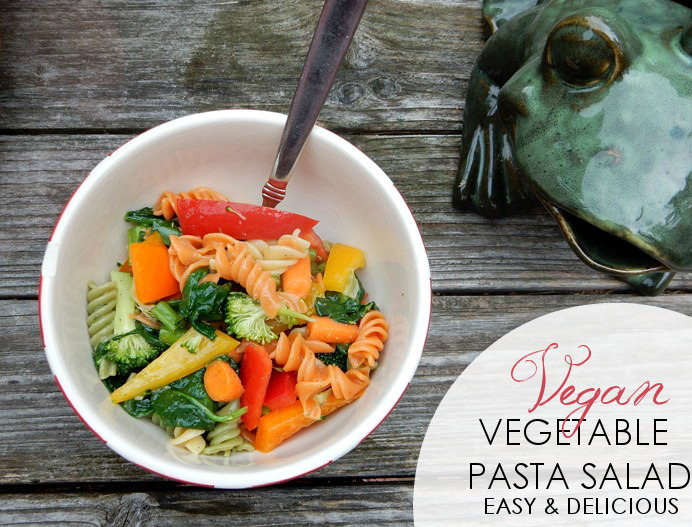 My pasta salad recipe has been much loved through the years – both by myself and others. Today, I’m going to let you in on my little secret. The secret to the best pasta salad you’ve ever tasted? A packet of the very delicious Garlic and Herb salad dressing by Good Seasons. It’s one of those packets that you mix together and you can find it in the salad dressing aisle of major grocery stores everywhere. Of course, if you have your own favorite dressing that you prefer to use – feel free to swap that out. I just happen to be so addicted to this Garlic and Herb dressing that I could practically drink it. Step 1: In a large pot, boil water for pasta. Once boiling, cook for 9-10 minutes. 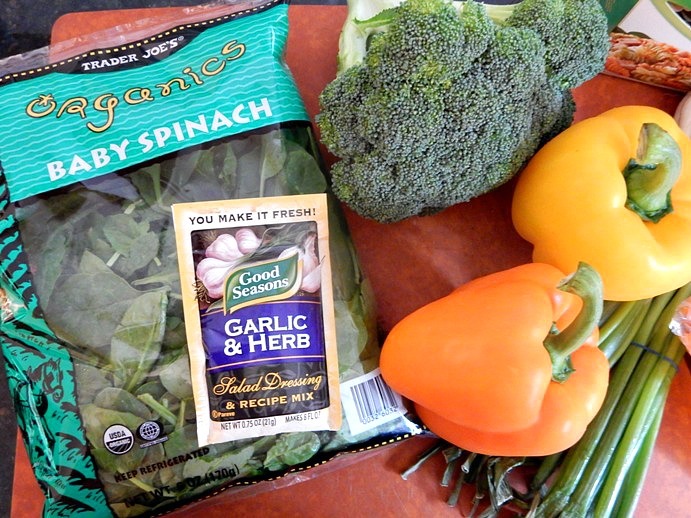 While that works, prep your veggies! 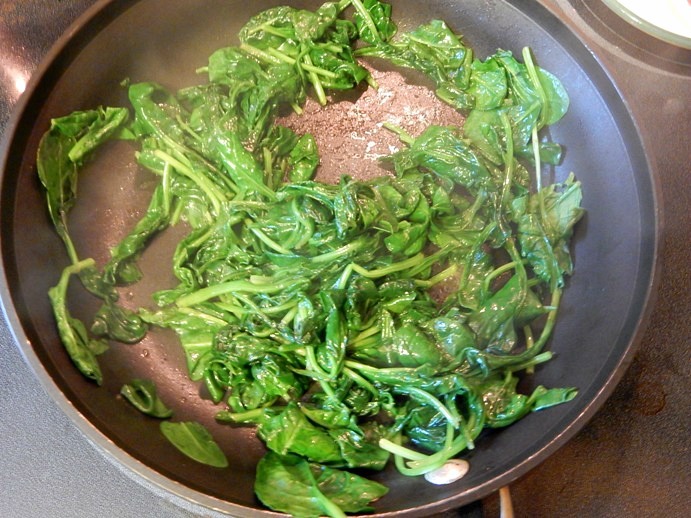 Step 2: Over medium heat, heat 1-2 tablespoons of olive oil and add full bag of cleaned spinach. Stir regularly until thoroughly cooked down. Set aside. Step 3: Get your chopping boards out and get chopping! 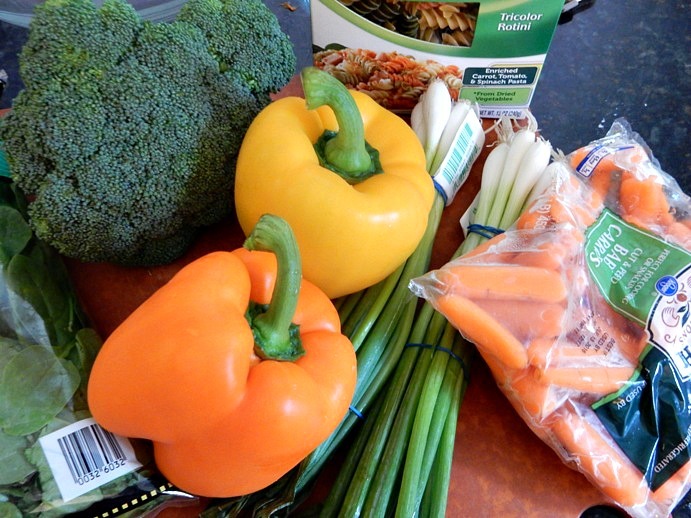 Chop your carrots, bell peppers, scallions and broccoli into bite size pieces. If you have a doggie, be sure to share! 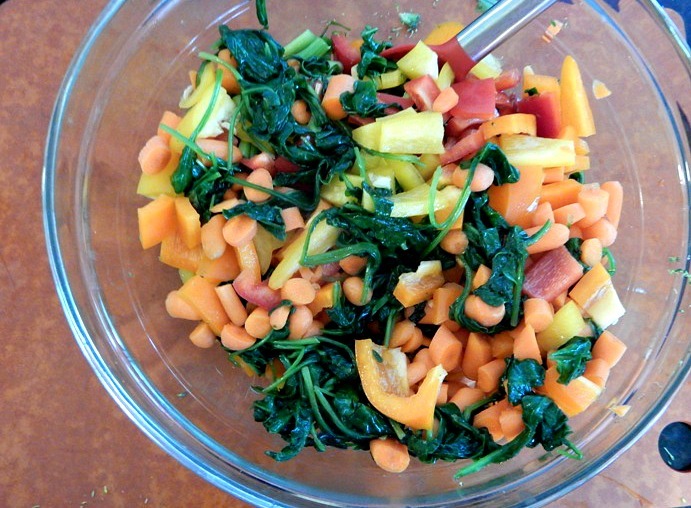 Step 4: Mix all of your beautiful chopped vegetables and sauteed spinach together in large glass bowl. We all know how greens are important for our health. As you prepare your dish you can read dietary requirements infographic and make your dish more healthy. Step 5: Your pasta should be about done now. Taste a spiral to be sure it’s cooked to your liking, then drain and rinse with cold running water. You can of course chill the pasta in the fridge if you have time, but I’m always in a rush so just toss my pasta around under cold water to make sure it’s chilled evenly throughout. Step 6: Make one packet of Good Seasons’ Garlic and Herb salad dressing according to directions. 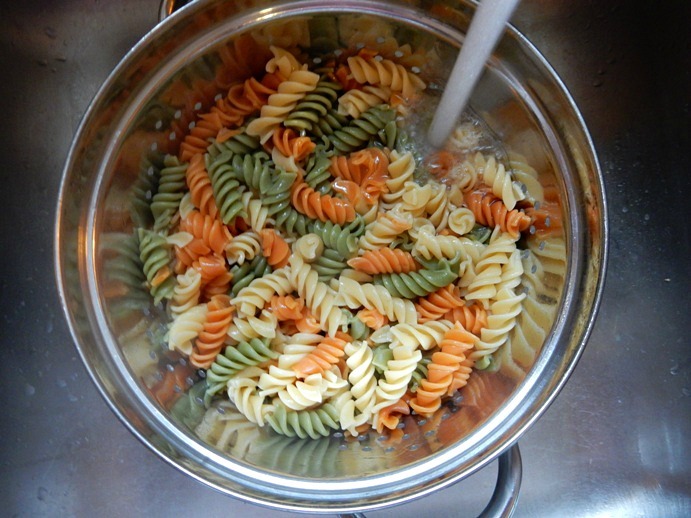 Step 7: Combine your chilled and drained pasta with your colorful vegetables. Add in a full bottle of the Garlic and Herb salad dressing, then stir together well. Salt and pepper to taste. Yum! Step 8: If serving immediately and you don’t anticipate leftovers, that one bottle of dressing will be enough. If you think you may have leftovers or plan to eat through the week, definitely whip up a second bottle of the dressing to sprinkle in as your serve. While in the refrigerator, the pasta will absorb the dressing and so it will need a little sprucing up as leftovers. 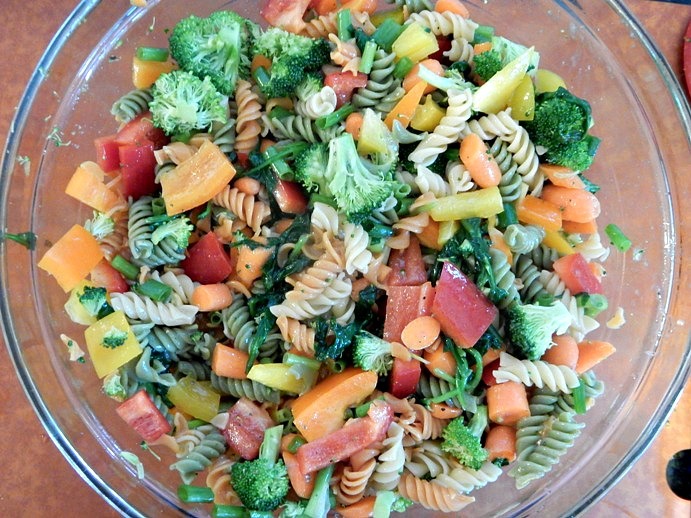 Honestly, this is one easy and delicious pasta salad! Feel free to experiment and add in other veggies as you like. 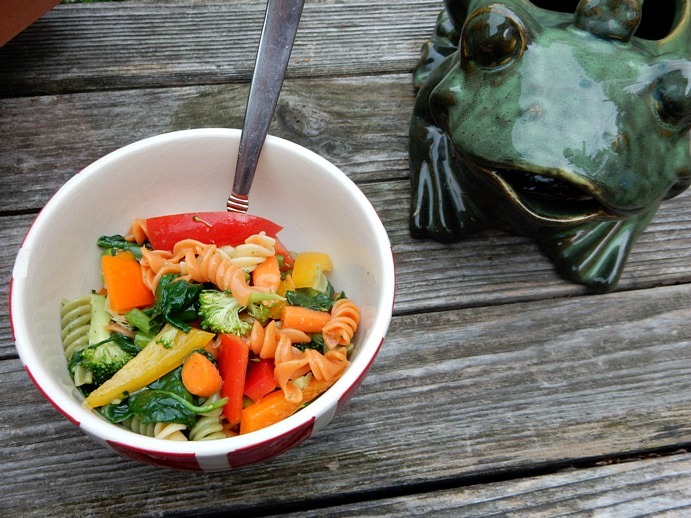 Two great things about pasta salad? 1) There are no rules when it comes to ingredients. 2) It’s virtually impossible to screw up the recipe. So have fun, go wild and enjoy the summer produce! I have absolutely NO idea how we’re already at the 4th of July week, but you can bet I’ll be whipping up a bowl of this pasta salad to enjoy over the long holiday weekend. I can picture it now: lounging by the pool with Florence and the Machine and a bowl of pasta salad. Absolute bliss! Thank you so much for reading and if you give the recipe a try, let me know what you think!